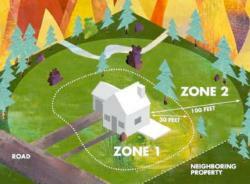 Through proper planning, a person can have both a beautiful landscape and a fire safe zone around their home. It is important to create a defensible space. The Lassen County Fire Safe Council has put together Living With Fire as a resource guide for Lassen County residents. They have also published a free Landscape Plant Guide to help homeowners choose the right plants for high fire hazard areas. When designing landscape, choose firewise plants and create a fuel-free area surrounding the home. Take into consideration plant arrangement keeping the area within 30 feet of the home "lean, clean, and green," with plantings arranged in islands to break up the continuity of potential fuel for a fire. Keep tree limbs and branches at least 10 feet away from the sides and roof of your house. Remove flammable materials such as needles, leaves, twigs and other debris from your roof and gutters, and from within 30 feet of your home. Forests and shrublands are natural "fire environments" and homeowners should prepare for the threat of wildfire by making a defensible space. Be firewise. Home Landscaping for Fire and Landscaping Tips to Help Defend Your Home from Wildfire are publications from the University of California ANR (Agriculture and Natural Resources) Catalog.